This material will be added to the John William Foster fonds that was created in September of this year with the acquisition of the 193 lantern slides Foster had in his possession. These lantern slides reflect images of Canadian Protestant missionary work in China in the late 19th and early 20th centuries and have been explored in an online exhibit on the ARC’s website. 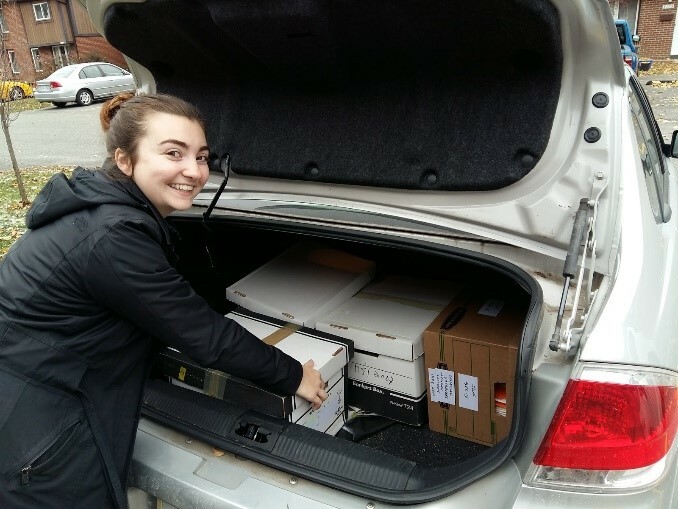 Co-Op student Chloe Dennis loading the boxes to be taken to the ARC. 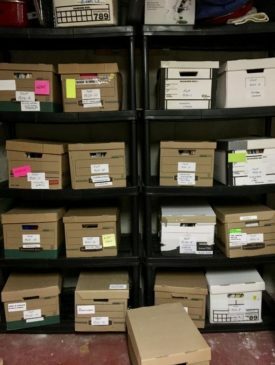 The recently collected material is still in the early archival processing stages at ARC and is being worked on by CO-OP student Chloe Dennis. Chloe Dennis is a third year History student at Carleton University and has been working with ARC since September 2017. She created the John William Foster fonds; put together the online exhibit highlighting the lantern slides; promoted collection highlights on the ARC Facebook page; and is now tackling this next task to archive John Foster’s work. So far, the material encompasses John Foster’s career in civil society as a scholar, policy leader, and diplomat. That is the working together of non-governmental organizations (NGOs) and institutions to work for and towards the will of the people. Foster has been able to contribute placing civil society within the global political and institutional landscape. With documents and ephemera from his time at OXFAM Canada, the University of Saskatchewan, and the North-South Institute, Foster’s work on civil society is rich and diverse. 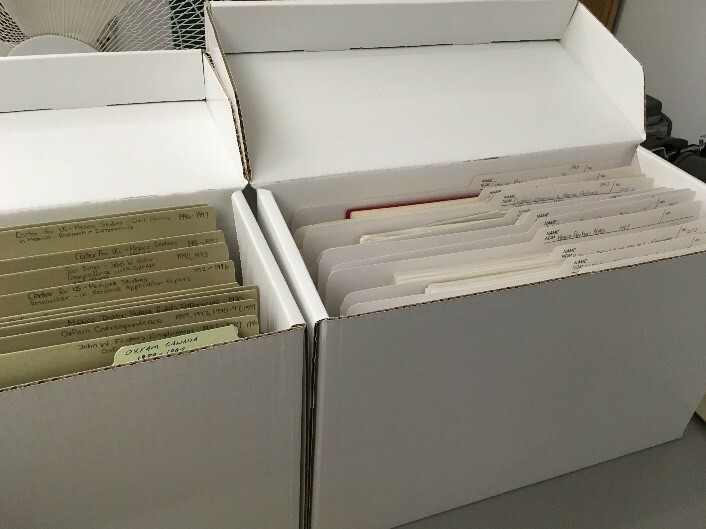 In the coming months, the material is to be fully processed, catalogued in the John William Foster fonds at ARC, and readily available to any interested researchers. 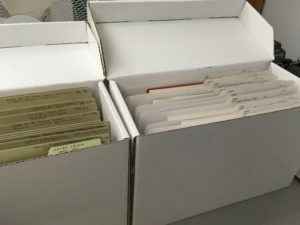 A sample of some of Dr. Foster’s files already processed. In recent years, the Chilean government honoured John Foster for his work and commitment to human rights in Chile for which the Latin American Working Group (LAWG) was a key contributor; and he has attended the launch for the LAWG collection at York University’s Centre for Research on Latin America and the Caribbean (CERLAC). To read more about the Chilean government’s recognition of John Foster and the LAWG’s work, click HERE. Or to read more about the launch of the LAWG’ collection at CERLAC, click HERE. The image at top features boxes picked up from the home of Dr. Foster.